A lot of the skirts in my closet have come from the thrift store. They are often around .99cents & perfectly patterned which makes them great additions to my wardrobe but there's been something I've been avoiding doing lately and that is chopping them all short. My favorite skirts to pick up are mid-calf or longer because I really like the look. But it's getting to be warmer here & I'm thinking of shortening up the majority of the skirts in my closet. The problem is I'm too afraid I won't like it! I have one skirt particularly in mind when I say this: a bright orange one I've had for ages that falls perfectly at the calves. I used to wear it a lot but I don't find myself wearing it at all now. I really want to cut it shorter but I'm really scared I won't like it! I mean, it is just a dollar or so skirt that I've had since at least 2009 but what if I chop it & hate it? What if? 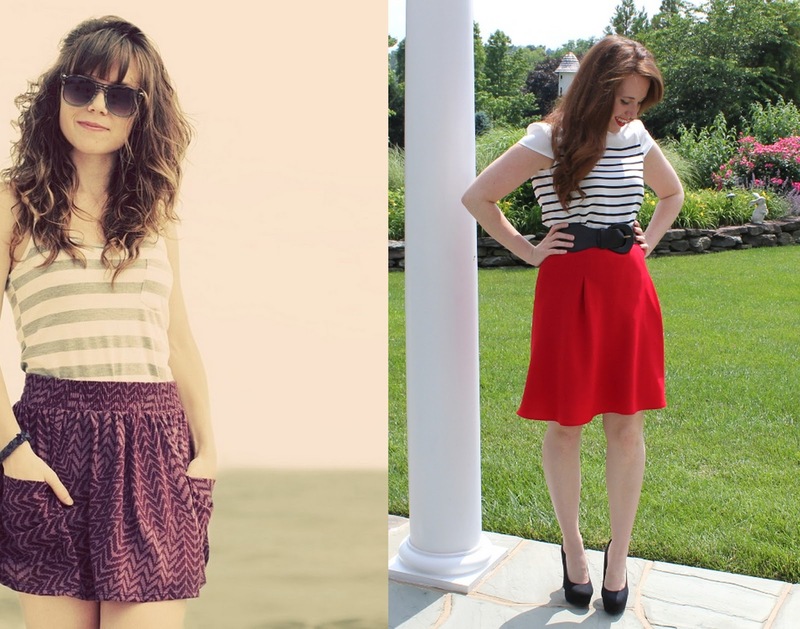 I'm liking the shorter skirts for summer (still keeping them a bit longer for work) but I also like the long look, too. If they all get cut short, there's more room for tights in the winter months....but the long, bohemian-y look still really strikes me...but I don't wear the long skirts hardly any. What am I to do? How do you feel about it? Should I cut & hem them all up or leave them alone? Do you like shorter skirts or longer skirts? Which get more wear in your closet? Mo! I loved this post because I am dealing with the same thing right now! it's so hot in Michigan, but I don't want to cute them off for fear of hating the look! I saw this post the other day and it's the firs thing I thought of when I read yours! Maybe this is your answer!